PGM Boys Full Body Dress Form, available size: Small (8 - 10), Medium (12 - 14), Large (16 - 18). 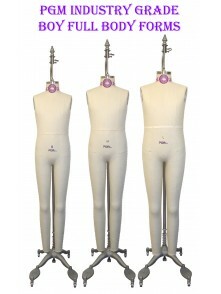 Click to see detail Size Table of PGM Full Body Boys Dress Forms. However, in fact, boys size is total different with girls size, especially the measurement of neck to front waist, and neck to back waist. Please click to reference PGM Girls Dress Form Size Table. For further size info, call 1-888-818-1991. PGM also custom made your requested size dress forms. Some of online info indicates same size number for boys' dress form & girls' dress form, such as, 7,8,10, 12, 14, 16...... However, in fact, boys size is total different with girls size, especially the measurement of neck to front waist, and neck to back waist. Please click to reference PGM Girls Dress Form Size Table. For futher size info, call 1-888-818-1991. PGM also custom made your requested size dress forms. Measuring from the top of the head to the ground without shoes. Measuring at the fullest part under the arms. Measuring around your hips at the widest part.